Say Hello to one of the cutest dogs on the planet. 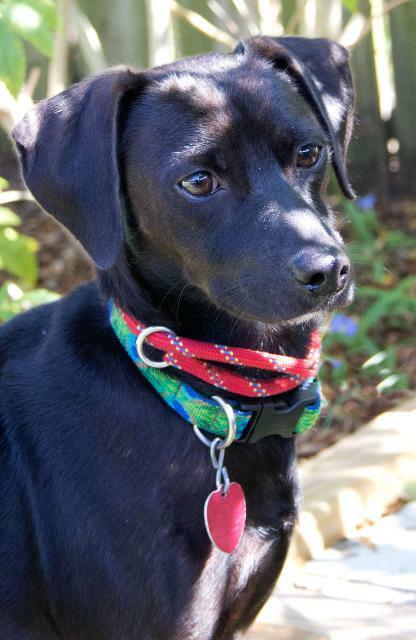 This is Grady, a 1 ½ year old Whippet mix who has a love-bug in his ancestry. He’s a little guy – only about 22 lbs. and stands only knee high to a 5’ woman. And pretty typical to his breed, he’s a quiet kinda guy, not prone to barking, and does love cuddling – he’s the kind of dog that knows what a human neck is for! Whippets have been called a "poor man's racehorse" and the Ferrari of canines. Descended from Greyhounds, these dogs were bred a sighted hunters, trained for lure coursing, agility and rat catching. Despite being bred for racing, Whippets can be couch potatoes. When not running around, they are usually asleep or cuddled in their owner's lap. They are the fastest dog of their weight, capable of achieving speeds of 35 miles per hour. This is due to their unique way of running, which is referred to as a double suspension gallop. Now, I have to tell you that the only running I’ve seen Grady do is his enthusiastic bound to the fence to meet his next newest best friend – he could be chairperson for the Greeting Committee! Stop out & meet this adorable little guy, one of his kisses on your neck will make you a believer in the wonder of the Whippet.